CONTACT US TO ORDER YOURS NOW!!! Click here for a Video from one of our very satisfied customers. 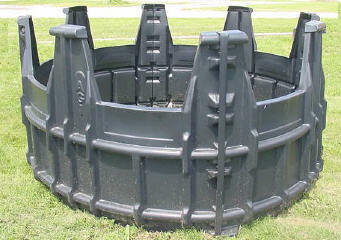 48" high and 8' diameter, Short sections 32"
This plastic hay rings will not rust or corrode & are made of 100% recycled HDPE. Features include smooth, rounded edges safe for both you and your horses. And, unlike metal which is susceptible to permanent dents, dents in our plastic hay rings are only temporary and should easily pop out and back into shape. High Dividers keep more hay inside. Works great for small or large squares too. Customers often ask if horses go into the feeder or ring. It is very very very rare - in fact I only know of one horse that does it and he jumps into metal on...es too - but our feeders are easy enough to lift over him to get him out - this is where the ring sits in front of an 18.1hh Warmblood Dressage horse. It happens to be my horse and he can be aggressive and is very athletic. Never once has he even tried to get inside a ring or feeder and if you see where the top of the feeder sits - it would be near impossible for him to lift a leg inside as he stands by the feeder. It takes effort to jump into a feeder or ring. It is not something where they just lift a leg inside. I have heard stories of horses cast against metal feeders. If horses roll into our rings/feeders it is easy to move and usually the movement of the horse itself will move it enough for the horse to safely uncast. We are now offering Slow Feed Nets to compliment our Hay Feeders and Hay Rings. Our feeders will protect your net from damage from hooves, shoes, stomping and reduces the risk of holes where horses can get caught in the netting. 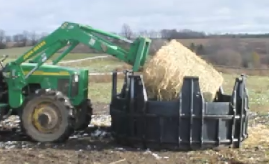 Hay Nets are available in round bale, large square and small square sizes. • Healthier feeding - slow delivery as opposed to the gorge and starve cycle which is hard on horses' systems. Slow Feed Netting (Slow Feed Extreme / Opening size: 1") The Slow Feed Extreme is our second smallest mesh that we carry and should not be used when introducing a horse to slow feeding. We recommend that horse owners start with the 2” web then over the course of time wean their horse to the 1” mesh web. Horses that don't maintain a good weight using the Slow Feed should be transitioned to the 1”. It's great for the extreme cases of metabolic disorders, for horses that are on stall rest, or for sheep and goats. Remember that if your horse creates a hole in the net to tie it closed. It is recommended to look closely at the net every day to inspect it for any holes that your animal may get caught up in. Always offer free choice hay along with your Slow Feed Net until your animals have learned to successfully graze from it. Note: Order bag 1 foot larger than actual bale size. 30 Day Manufacturers Warranty on hand sewn seams. Returns/Exchanges within 7 days for new, unused nets. Customer pays all shipping fees. For hygienic reasons, nets are non-returnable once used. Haynets are not indestructible. Warranty does not cover damage caused by use, including chew holes.